Giovanni Ruffini, in addition to editing this title, is a contributing author, “Late Antique Pagan Networks from Athens to the Thebaid,” pp. 241-257." Book description: As one of the greatest cities of antiquity, Alexandria has always been a severe challenge to its historians, all the more so because the surviving evidence, material and textual, is so disparate. New archaeological and literary discoveries and the startling diversity of ancient Alexandria (so reminiscent of some modern cities) add to the interest. The present volume contains the papers given at a conference at Columbia University in 2002 which attempted to lay some of the foundations for a new history of Alexandria by considering, in particular, its position between the traditions and life of Egypt on the one hand, and on the other the immigrants who came there from Greece and elsewhere in the wake of the founder Alexander of Macedon. -- Publisher description. Harris, W.V. and Giovanni Ruffini, eds. Ancient Alexandria between Egypt and Greece. Columbia Studies in the Classical Tradition 26. Leiden: Brill, 2004. 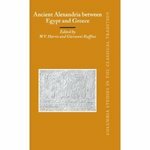 Ruffini, Giovanni and Harris, W. V., "Ancient Alexandria between Egypt and Greece" (2004). History Faculty Book Gallery. 27.